Reverb on some songs is like a cowbell—once it hits your ears, the only answer is more. 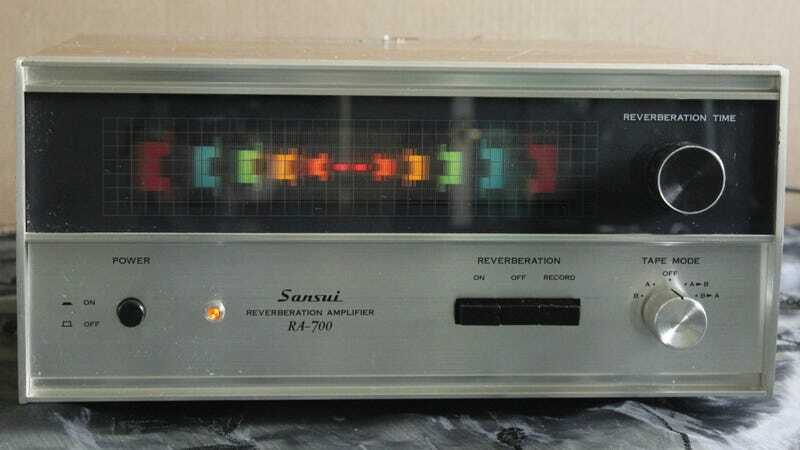 You'll have as much echo as your tape deck can handle with this $89 Sansui RA-700 reverberation amplifier. To top it off, this Japanese unit has a rainbow LCD display—a trippy visual punctuation to show where your reverb time is set within the 1.9 and 3.2 second range. In their late-70s/early-80s heyday, Sansui was a good choice to boost a hi-fi system. This one's blinking lights and walnut grain finish might also punch up the den's decor. But beyond that, it's just reassuring to know you have a little extra spring-loaded reverb on hand—you'll appreciate the old Sansui some Saturday night, after a few drinks, when 0.2-percent more harmonic distortion is the only thing that can make your Psychocandy tape by the Jesus and Mary Chain possibly sound any better.